Considering I have never been a die-hard Mega Man fan like many people on the internet maybe I am not fit to review this game. On the other hand, maybe I am more fit than anyone else. Honestly, Mega Man has never won over my heart no matter how many of his series (and yes there are a ton) I play. The original games were solid platformers that offered a decent challenge but I failed to really get into them. The Mega Man X series I enjoyed, but then again I have only played the first one and doubt I will ever play another. Mega Man for me has always just been there. Yes it is a wonderful idea with some wonderful games I am sure, but again, the series just does not do much for me. I went into Mega Man and Bass with high hopes constantly re-assuring myself that this game would be the turning point for me. It was, but not in a good way. Difficulty is always important to a game. Any good game will make you rage every once in a while. At the same time, finally beating the part you were stuck on for so long should feel rewarding. This is not true in Mega Man and Bass though and it is apparent right from the beginning. I will admit I had a smile on my face upon loading up the first level and seeing the awesome graphics and hearing the awesome music but after entering the very first area I was greeted by a randomly spawning onslaught of drills in a very narrow hallway. My smile had disappeared, in fact it had turned into to a rather large frown. Challenging gameplay has always been a staple for the Mega Man series because it has always been done right, with the exception of a few games. This game is one of those exceptions. Every death, worse, every time you are hit, it feels unfair. 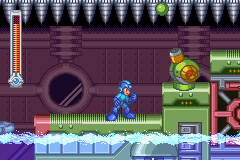 The character sprite is too big and has no duck ability so bullets are nearly impossible to dodge and throughout the entire game enemies will pop out of nowhere at complete random with total disregard of the fact that you may be mid-jump and that getting hit could lead to yet another unfair death. Difficulty in Mega Man and Bass feels tacked on and forced and as a result makes your deaths undeserved in many occasions. Graphically the game looks outstanding. 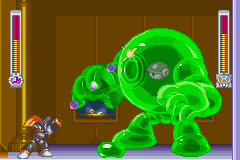 Large and colorful sprites make the game a sight to be seen but this becomes a problem from a gameplay perspective. Backgrounds are dull and stagnant but still passable. Animations are detailed, smooth, and look great overall. The music of the game stays true to music of past Mega Man games and that is generally awesome. Fast paced techno jams keep the game upbeat and immersive. Level design is great as well. Tons of hazards and enemies will keep you on your toes and there are plenty of collectibles to be found. Many of these collectibles require upgrades which you may not have yet in order to reach them which is a great incentive to revisit older levels. The game controls flawlessly and you really feel like you are in total control of your hero of choice. Giant sprites hold the core platforming back though despite how nice they look. Both characters are, simply-put, huge. They are often the largest sprites on screen and this makes precision platforming extremely difficult. Also despite its emphasis on patterns and memorization the game throws tons of random enemies and events at you. This makes it seem like Capcom was unsure of what they wanted this game to be. 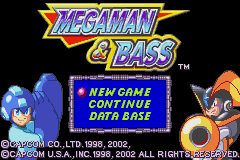 Bass is a ton of fun and feels better optimized than Mega Man for the game. His burst-fire cannon and double jump abilities mean you have to worry less about precision and more about having fun. Boss battles stick to the tradition of being brutal and require memorization but the reward of getting a new power keeps you going despite how many times you die. Fans of the 16-bit and 32-bit Mega Man games are likely to enjoy Mega Man and Bass, but there are too many frustrating moments and questionable design choices to say this is a good game. It is an average platformer that aspires to evolve the series but ultimately fails. If you love Mega Man and can tolerate cheap deaths then maybe this game is for you.